Got the first step done today. Don’t let someone tell you that you can’t free hand mill a log with a chain saw. You just have to be a bit nuts to try it. Of course, the nail in the wood didn’t help much. 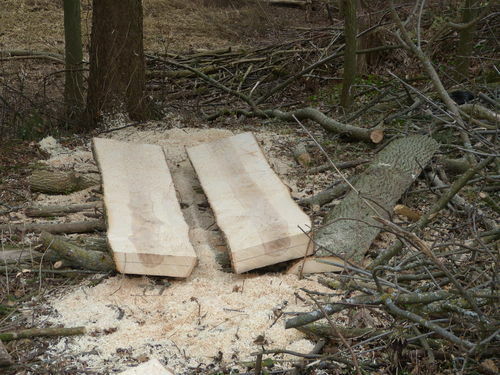 I now have 2 slabs of ash, over 4” thick, about a foot wide inside the bark at the narrowest point and about 7’ 4” long. I hope to get 2 3×11 by 6’ long slabs for the top of the work bench. Something that I am getting video of and it will show up on my You Tube channel now and then as it progresses. Sticker them nicely, keep them dry, and then we’ll start watching your progress in about four years! According to Chris Schwarz, a bench can be (and has been) worked with green wood, so I am not overly concerned with it being seasoned too much. I have to gather more parts, so there will be some time for it to dry a bit. I am going to put a coat of paint on the ends, sticker them and put some weight on them. I will take some of the really bad uneven sections down a bit too. Well, it should be a looker! The ash looks great in the rough. I look forward to seeing the completed bench. Incredible ambition, I love it!